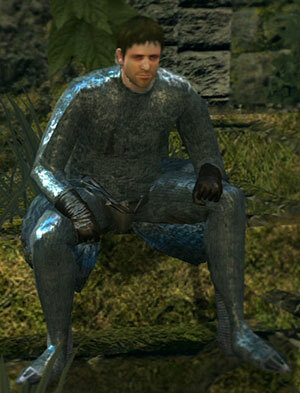 He is the first character you see when you first arrive at Lordran. He laments his undead status in Lordran. Throughout the game, while at Firelink Shrine, he gives advice or opinions about locations, characters, and even the state of the player. He always resides next to the bonfire. Exhaust his dialogue after ringing both Bells of Awakening. Hollowed, he stands next to the first wooden bridge leading to the ruins. Killing him does not have any effect on the story or a covenant. Be wary about accidentally making him hostile while leaving him alive, as he attacks you as soon as you respawn at the bonfire. 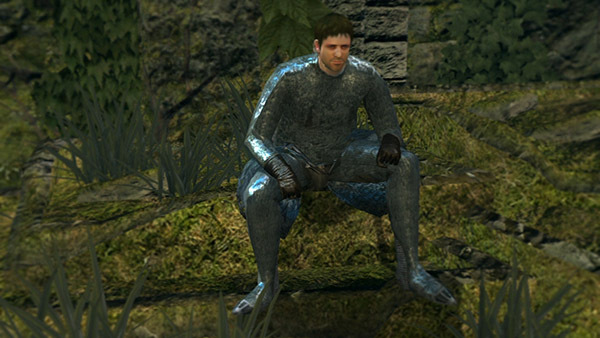 Equipped with a unique version of the Chain Set which contains no item names or descriptions and cannot be equipped on female characters. Making Kingseeker Frampt leave does not prevent him from hollowing, even if you do it without having ever spoken with him. If you do make him hostile early on and you are having trouble killing him, you can just block all of his attacks and walk him over to the cliffs near the Firelink Shrine bonfire. Here you can wait for him to jump off of the cliff or you can kick him off the cliff. As he does not drop any item nor does he have any effect on other NPC's story, you do not need to worry about killing him by kicking him off the cliff as he only drops souls. Be wary that he is one of the NPCs who can parry. He usually attempts to parry you when he holds his shield up. Well, what do we have here? You must be a new arrival. Let me guess. Fate of the Undead, right? Well, you're not the first. But there's no salvation here. You'd have done better to rot in the Undead Asylum… But, too late now. Well, since you're here… Let me help you out. There are actually two Bells of Awakening. One's up above, in the Undead Church. The other is far, far below, in the ruins at the base of Blighttown. Ring them both, and something happens… Brilliant, right? Not much to go on, but I have a feeling that won't stop you. So, off you go. It is why you came, isn't it? To this accursed land of the Undead? Oh, your face! You're practically Hollow. But who knows, going Hollow could solve quite a bit! Hm, what? Restoring your humanity? Collect it bit by bit from corpses, or you can butter up a cleric, and get yourself summoned. And the quickest way, although I'd never do it, is to kill a healthy Undead, and pillage its humanity. Coveting thy neighbour is only human, after all! Don't try anything clever. You might regret it. Oi, hold on…Don't tell me, have you been cursed? Oh woe is the Undead who's cursed on top of it all Harsh times; harsh times indeed! No, no, I'm sorry. Here, let me share a nice tip. Long ago, I was told of a remedician who resides in New Londo. Does he really exist? Well, go and find out for yourself. But don't blame me if he's just an apparition! Hm? What, you want to hear more? Oh, that's all we need. Another inquisitive soul. One of the bells is up above in the Undead Church, but the lift is broken. You'll have to climb the stairs up the ruins, and access the Undead Burg through the waterway. But I'd die again before I step foot in that cesspool! There's nothing to speak about, really. Oh, actually… Something strange did happen. That crow flew off with somebody in its clutches. I think it was a man curled up in a ball. Don't you ever repair your weapons? You just need the right tools… or some powder. If you keep swinging those scraps around, you'll be mistaken for a hollow! Bloody hell, what is it now? I'm not up for chatting. Leave me alone. What's wrong? Get a bit of scare out there? No problem. Have a seat and get comfortable. We'll both be Hollow before you know it. Have you been to the ruins of New Londo below? Just head down the stairs, and take the lift. It's certainly worth a visit. It was once an Undead city. You may find a clue or two. Oh, have you seen that terribly morose lass? She's stuck keeping that bonfire lit. Sad, really. She's mute and bound to this forsaken place. They probably cut her tongue out back in her village, so that she'd never say any god's name in vain. How do these martyrs keep chugging along? I'd peter out in an instant. Don't you ever think to forge your weapons? You'd better find a smithbox soon! Unless you enjoy swinging about with blunt instruments. How did that silly sorcerer's apprentice end up? You know, the one always prattling on about Master Logan. He left for the Undead Burg, but never came back. Serves him right. If even Old Big Hat can't make it out there, what chance does he have? I hope he enjoys his new life as a Hollow. How did that nutty sorcerer make it back? Unexpected, but I suppose stranger things have happened. How did that raggedy old chum end up? You know, the one who idolized some godmother of pyromancy. He left for Blighttown, but never came back. Whereas most flee from sickness, he dives right in. Well, nothing will harm him once he goes Hollow. How did that old man make it back? Why, what a surprise. I didn't expect you to make it. … Oh, somebody rang the bell… Wait. Was it you? You never give up, do you? I don't know how you do it. Well, don't stop now. Only one more, but it's going to be suicide. Oh, somebody rang the bell… Wait. Was it you? That virtuous little maiden, complete with followers in tow. They're probably going straight to pillage graves. I've heard enough about "M'Lady" for a lifetime. Did you hear about the maiden? Did her follower die, or was she abandoned? Who knows. But I suppose we've heard the last from "M'lady". She's shuffled off somewhere. I believe to the Undead Church. These ruins are probably too awkward for her. Did you ring the second bell? That is incredible, I must say… But now we have a new problem. This is no laughing matter, I tell you. Damn, that stench… And I was really beginning to like it here! Lousy rat! You have some nerve! I may be crestfallen, but I'm not defenseless, you rascal! You will soon regret this! How'd you let me do that to you?